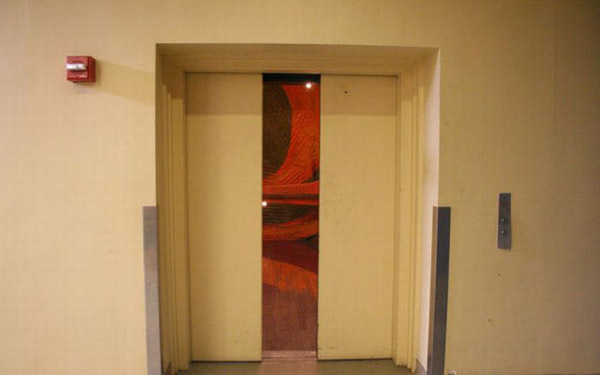 Taking the elevator down from my therapist’s office on the 10th floor, the typical lift that is always crowded because it is designed to save space, and crammed with people, to boot, a man shades the top three buttons with his finger, one of which is the image of a fire man helmet beside a key hole for burning. The motion of his finger is rather like the way some smartphones’ unlocking is that same zig-zag, barely-touch, design-a-ziggurat motion, as if one were shadowing instead of touching. Then, he starts his main ritual, which is to touch each floor’s number on the way down. He doesn’t seem to see me watching. Or, if he does, he can’t stop himself. I would love to interject, stick my finger into the mix. Of course, I don’t do it. Instead, I think: I should have taken the stairs.